I have a light switch that has old knob & tube wiring it is hot on one side and dead on the other when the switch is off, like it should be but when the switch is on both sides are dead, the light does work but what do they have going on with it? I think you are reading your tester incorrectly. I say this because the light bulb is the simplest of testers. It only works correctly when there is a 120 volt difference between each side of the screw base. I'm thinking that when you switch is closed that you are not getting a reading because the voltage difference is 0 volts. 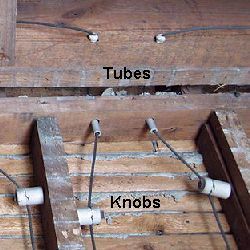 That is as it should be in old knob and tube. The bigger question is have you consulted an electrician about replacing that knob and tube wiring yet. I is probably about 70 years old now. I don't have anything that is 70 years old that work in a reliable way. You should be putting together a plan for the wires replacement.